"ANALYSIS OF HOROSCOPE FOR MARITAL DISCORD"
-	The most effective point of the houses signifying marriage, which are the seventh, second, fourth, eighth and twelfth houses. -	The determinants of marriage i.e. the planets ruling the mooltrikona houses signifying marriage. -	Jupiter as significator for the husband. -	Venus as significator for wife and general significator of marriage. -	The sign Libra, which is the seventh house of the natural zodiac. The weak planets delay the marriage while the close or exact afflictions to weak planets becoming indicators of marriage cause marriage problems. The functional malefic planets, especially Mars, the lord of the sixth house or Ketu forming relationship either with the ascendant, the seventh or second or fourth house or their lords make the native aggressive and ill-tempered if the benefic influence of strong functional benefic planets is absent. 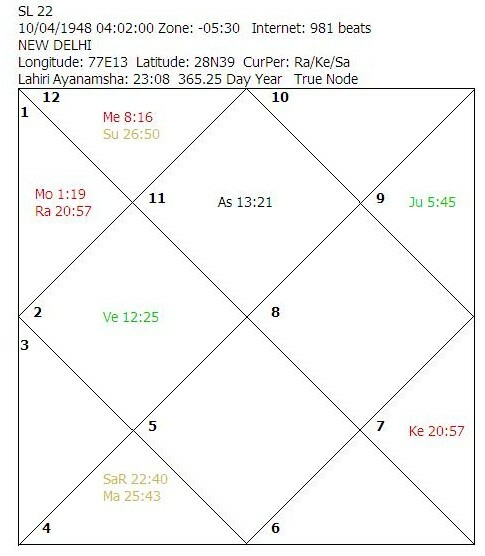 Rahu or Ketu joining hands closely with the functional malefic planet, Mars, make the native/spouse stray and that becomes the reason for the discord. The selfish nature of any of the married partners is governed by the weakness of Jupiter. The debilitated planets in second house close to the most effective point or the lord of the second in debilitation also indicate marital discord. The marital discord has two dimensions: a peaceful separation/divorce or quarrels/disputes followed by criminal law-suits. The separations and loss of happy married life are caused by the functional malefic planets whenever they closely influence the house(s) signifying marriage and/or the determinant planet(s) and/or the significator planet(s). 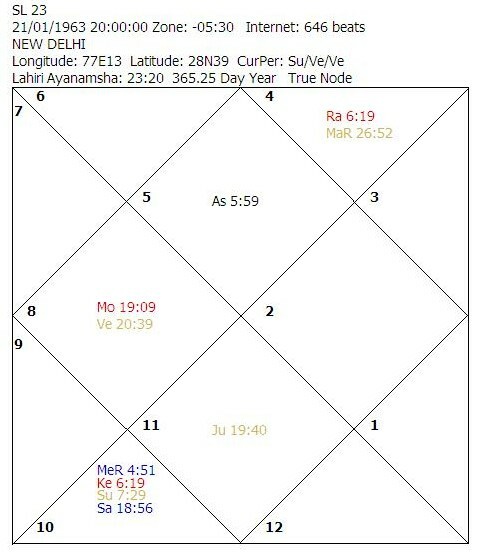 When such a planetary relationship/influence is developed by the involvement of the lord of the sixth house or the lords of the ascendant, second, fourth, seventh, eighth or twelfth house joining the sixth house start operating, disputes leading to criminal law-suits followed by divorce start. CHART 22: Male born 10th April, 1948, 0403 Hrs. The sign Aquarius rises in the ascendant which means that besides Rahu and Ketu, the Moon and Mercury become also functional malefic planets. The lord of the eighth house is debilitated and placed in the second house. The lord of the seventh house is weak as it is in old-age. The lords of the third house and ascendant are placed in the sixth house. The lord of the sixth house is placed in the third house. The planetary configuration of third and ascendant lords in the sixth and sixth lord in third house makes the person quarrelsome, especially when one runs the sub-periods of the planets involved. The native saw the main periods of both the Moon and Mars and saw enormous incidence of disputes in life with all concerned. The placement of the most malefic planet in the second house gave him problems in the marital relationships. The native was also involved in the marital disputes and his marriage ended in a divorce. CHART 23: Female born 21st January, 1963, 2000 Hrs. The sign Leo rises in the ascendant which means that besides Rahu and Ketu, the Moon becomes also a functional malefic planet. Rahu and Ketu are close to the most effective point of the houses of their location and exactly afflict all the houses occupied and aspected besides closely afflicting both the lord of the ascendant and the second house placed in the sixth house. Venus and the Moon are weak as the most effective point of their house of placement is exactly afflicted by the aspect of Rahu from the twelfth house. Venus is additionally weak by being closely afflicted by the most malefic planet, the Moon. 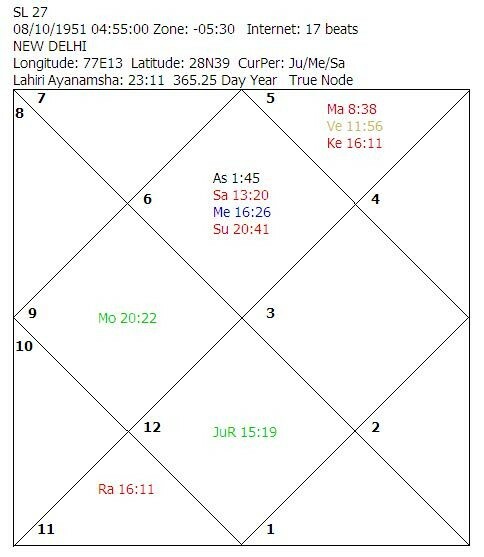 The lord of the seventh house is weak as it is combust, badly placed and the most effective point of its house of placement is exactly afflicted by the Rahu-Ketu axis. Jupiter is weak as its dispositor is weak. 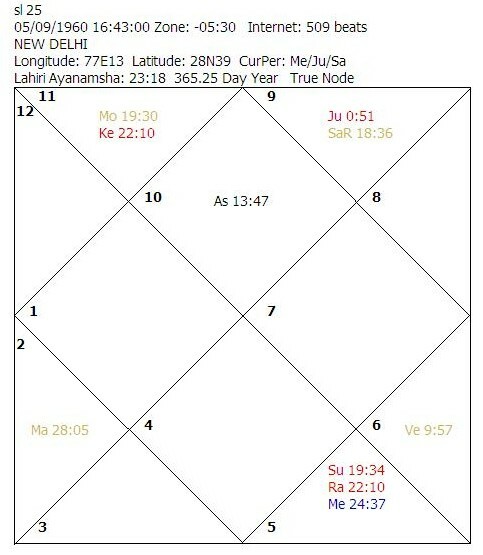 Mars is weak as it is badly placed, debilitated, in the state of old-age, has a weak dispositor and the most effective point of its house of placement is exactly afflicted by the Rahu-Ketu axis. 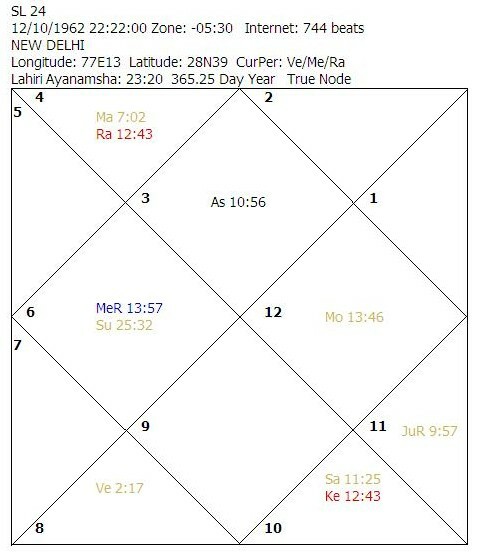 There are four planets in the house of disputes which clearly show the incidence of disputes in married life as the lords of the second and seventh houses are also involved. Aiding the negative combinations was operation of the main period of the afflicted Venus. During the sub-period of the afflicted Sun, placed in the sixth house, the marital relationship became inharmonious. 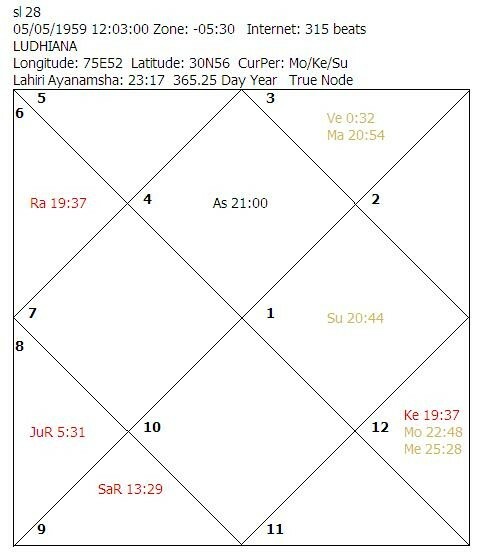 The following sub-periods of the Moon, Mars and Rahu did not favor any improvement. The inharmonious relationship and separation continued. The native, who approached for astrological help, was advised not to go in for a divorce as the natal configurations do not show improvement in any further marital alliance, as well. Therefore, for improving the relationship in the present marital alliance, she was suggested remedial measures for warding off the evil influences of the functional malefic planets and strengthening of the weak planets. CHART 24: Female 12th October, 1962, 2222 Hrs. The sign Gemini rises in the ascendant which means that Rahu and Ketu are the only functional malefic planets. 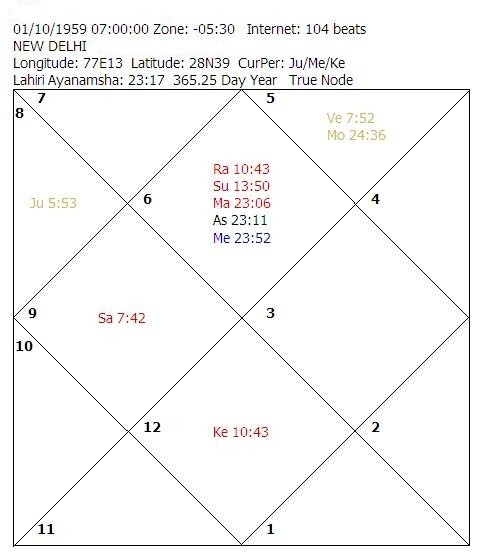 The lord of the ninth house, Saturn, is weak as it is badly placed, debilitated in navamsa and is under the multiple affliction of Rahu and Ketu. The lord of the seventh house is weak as its dispositor is weak. Venus is weak as it is badly placed and is in infancy. The lord of the second house, the Moon, is weak as it is debilitated in navamsa and the most effective point of its mooltrikona house is under the multiple afflictions of Rahu and Ketu. The Moon is additionally weak by being closely afflicted in the rasi chart. Mars is debilitated and occupies the afflicted second house. Rahu and Ketu are close to the most effective point of the houses of their location and afflict all the houses occupied and aspected. Mercury, the lord of the fourth house, is under the special affliction of Ketu from the eighth house. Besides the above mentioned afflictions to the planets, the affliction to the most effective points of the second, fourth, eighth and twelfth houses caused disturbance in marital relationship and resulted in a serious marital discord. During the sub-period of Mars, the inharmonious relationship started which was aggravated in the sub-period of Rahu in the main period of Ketu. During the sub-period of the weak lord of the seventh house, the divorce proceedings were started which were finalised in the sub-period of Saturn. CHART 25: Male born 5th September, 1960, 1643 Hrs. The sign Capricorn rises in the ascendant which means that besides Rahu and Ketu, the Sun and Jupiter become also functional malefic planets. The lord of the second house is weak as it is badly placed and its dispositor is weak. The lord of the ninth house, dispositor of Venus, is weak as it is badly placed. The lord of the seventh house, the Moon, is weak as its dispositor is weak and it is exactly afflicted by the most malefic planet, the Sun, from the eighth house. 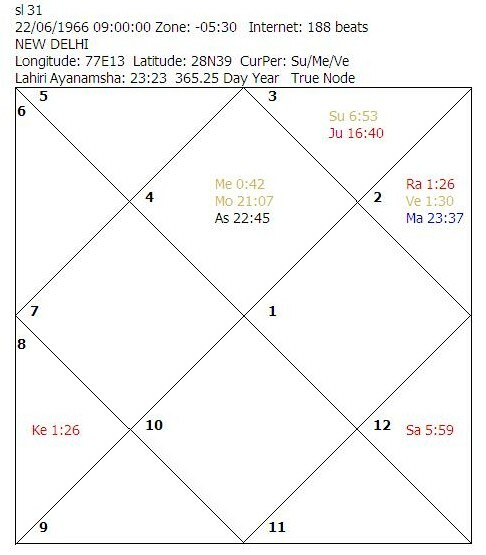 The lords of the seventh, eighth, ninth and second houses are closely afflicted by the close conjunction/aspect of Rahu/Ketu. Venus, the significator for wife, is weak as it is debilitated and its dispositor is weak. Since in this chart the determinants of marriage and the significator of marriage are all weak and some of them are also afflicted, the problems of inharmonious relations started right from the beginning of the sub-period of Venus, in the main period of Saturn. In the following sub-period of the afflicted Sun, the behavior of the wife went from bad to worse. 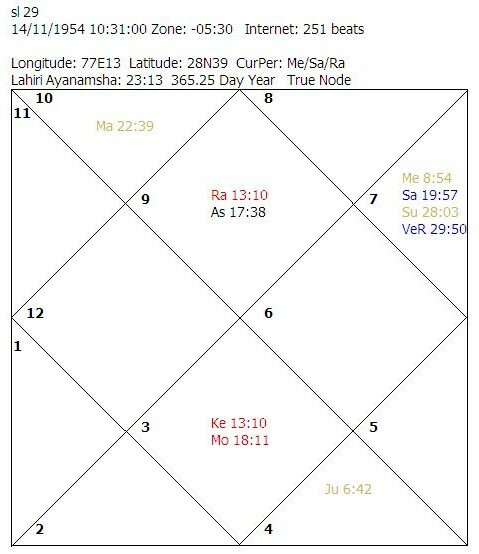 The divorce took place in the sub-period of Rahu which causes multiple and grave afflictions in the chart. Whenever a particular significator is in its sign of debilitation, the concerned relations fail to fulfill the aspirations of the native. CHART 26: Male born 1st October, 1959, 0700 Hrs. The sign Virgo rises in the ascendant which means that besides Rahu and Ketu, Saturn, Mars and the Sun become also functional malefic planets. The lord of the second house is badly placed in the twelfth house and is weak. Rahu and Ketu closely afflict the lord of the twelfth house. The most malefic planet, Mars, exactly afflicts the house occupied and houses aspected besides exactly afflicting the lord of the ascendant. The Moon is weak as it is badly placed, debilitated in navamsa and its dispositor is weak. The lord of the sixth house occupies the fourth house. Ketu closely influences the lord of the fourth house. In view of the weakness of the lord of the second house and the exact afflictions of Mars to the most effective points of various houses connected with marital affairs, the length of married life was cut short for a period of four months only. The divorce took place immediately after the marriage, in the sub-period of Rahu in its own main period. CHART 27: Male born 8th October, 1951, 0455 Hrs. The sign Virgo rises in the ascendant which means that besides Rahu and Ketu, Saturn, Mars and the Sun become also functional malefic planets. The lord of the second house is weak as it is badly placed and is closely afflicted by Mars, Rahu and Ketu. The lord of the ascendant is weak as it is combust and is closely afflicted by functional malefic planets, Saturn and the Sun. The lord of the sixth house is weak as it is combust. The Moon and Jupiter are strong in the chart. The native married during the sub-period of Saturn in the main period of Mars, at the age of 30 years. In spite of all efforts of the native to keep the wife pleased with all types of material comforts and possessions, the relations remained inharmonious from the very beginning due to the operation of the sub-period of the sixth lord. The disputes aggravated in the sub-period of Ketu and the wife deserted the native with a permanent separation. The divorce proceedings were initiated towards the end of the sub-period of Venus in the main period of Rahu. CHART 28: Female born 5th May, 1959, 1204 Hrs. The sign Cancer rises in the ascendant which means that besides Rahu and Ketu, Jupiter and Saturn become also functional malefic planets. The lord of the eighth house, ruling the marital tie is placed in the house of disputes. Rahu closely aspects the most effective point of the seventh house and afflicts the same. The lord of the fourth house, Venus, is weak as it is in infancy and is badly placed. The lord of the third house, Mercury, is weak as it is debilitated. As Mercury is dispositor of Rahu, which afflicts the seventh house, the impact of Rahu becomes more serious. Mars, the dispositor of the Sun, is weak as it is badly placed. The lord of the second house, the Sun, is weak as it is debilitated in navamsa and its dispositor is weak. The weakness of the lords of the second, fourth and eighth houses, affliction to the most effective point of the seventh house and the placement of the lord of the eighth house in the sixth house clearly indicate disputes in married life. The marital discord started during the sub-period of Rahu in the main period of Venus and separation took place in the sub-period of Saturn. The divorce took place in the sub-period of Mercury in the main period of Venus. CHART 29: Female born 14th November, 1954, 1032 Hrs. The sign Sagittarius rises in the ascendant which means that besides Rahu and Ketu, the Moon becomes also a functional malefic planet. 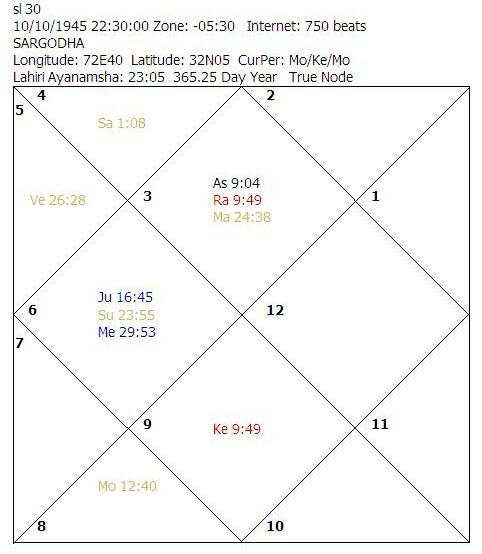 The most effective point of the seventh house is severely afflicted by the exact conjunction of the most malefic planet, the Moon, and the close malefic influence of the Rahu-Ketu axis, which makes not only the seventh house very weak but also the prime determinant of marriage, the Moon, as the most effective point of its house of placement is exactly afflicted by itself. The Sun is weak as it is debilitated and in old-age. Venus is very weak as it is almost exactly combust and in extreme old-age. Jupiter, the lord of the ascendant, is weak as it is badly placed, its dispositor is weak and the most effective point of its mooltrikona house is exactly afflicted by the Moon. Mercury is weak as its dispositor is weak. Mercury is also closely afflicted by the functional malefic planet, Ketu. Saturn is weak as it is combust and its dispositor is weak. The Sun, Venus, Saturn and Mercury become additionally weak as the most effective point of their house of placement is closely afflicted by Ketu. Mars is weak as it is debilitated in navamsa and occupies the second house. The severe afflictions to the most effective point of the seventh house and the simultaneous weakness of the prime determinant of marriage, the significator of husband and the significator of marriage resulted into a marital discord. The husband abandoned the native and remarried without even a formal divorce. The native is living with her parents. CHART 30: Female born 10th October, 1945, 2230 Hrs. The sign Gemini rises in the ascendant which means that Rahu and Ketu are the only functional malefic planets. Rahu and Ketu are on the most effective point of the houses of their location and exactly afflict all the houses occupied and aspected. The lord of the fourth house is both combust and in extreme old-age and hence very weak. The lord of the second house, ruling family life, is debilitated and badly placed in the sixth house signifying disputes. The lord of the seventh house and significator for husband is also weak as it is combust, its dispositor is weak and the most effective point of its mooltrikona house is exactly afflicted by the Rahu-Ketu axis. Venus, the significator of marriage, is weak as it is in old-age, its dispositor is weak and the most effective points of its house of placement and its mooltrikona house are exactly afflicted by Ketu and Rahu, respectively. The simultaneous weakness of all the determinants and significators of marriage resulted in inharmonious marital relationships. The marriage of the native saw an end during the main period of Venus and the sub-period of Jupiter. CHART 31: Female born 22nd June, 1966, 0900 Hrs. The sign Cancer rises in the ascendant which means that besides Rahu and Ketu, Jupiter and Saturn become also functional malefic planets. The lord of the second house, the Sun, is weak as it is badly placed. The lord of the third house, Mercury, is weak as it is in infancy and is exactly afflicted by Ketu. As Mercury rules her initiatives, the affliction to Mercury gives faulty decisions. The lord of the fourth house, Venus, is weak as it is in infancy and is exactly afflicted by Rahu and Ketu. It is also closely afflicted by the most malefic planet, Saturn. Jupiter is weak as it is badly placed and combust. The weakness of two determinants of marriage, the lords of the second and fourth houses, the significator of husband, Jupiter, and the affliction to the lord of the fourth house, which is also the general significator of marriage, clearly show lack of marital happiness. The first marriage of the native ended in a quick divorce in the sub-period of Jupiter in the main period of Venus. The native was remarried in the following sub-period of Saturn, the eighth lord, after performance of remedial measures suggested to her.